Slaveholders used both psychological coercion and physical violence to prevent slaves from disobeying their wishes. Often, the most efficient way to discipline slaves was to threaten to sell them. The lash, while the most common form of punishment, was effective but not efficient; whippings sometimes left slaves incapacitated or even dead. Slave masters also used punishment gear like neck braces, balls and chains, leg irons, and paddles with holes to produce blood blisters. Slaves lived in constant terror of both physical violence and separation from family and friends ([link]). The original caption of this photograph of a slave’s scarred back (a), taken in Baton Rouge, Louisiana, in 1863, reads as follows: “Overseer Artayou Carrier whipped me. I was two months in bed sore from the whipping. My master come after I was whipped; he discharged the overseer. The very words of poor Peter, taken as he sat for his picture.” Images like this one helped bolster the northern abolitionist message of the inhumanity of slavery. 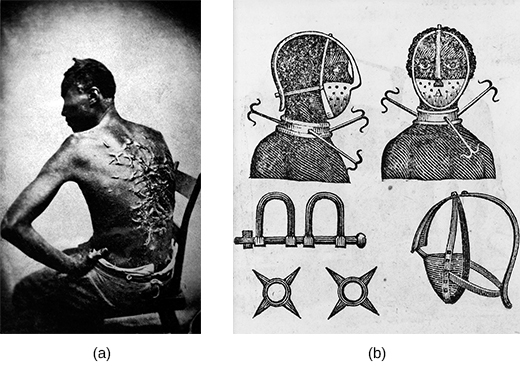 The drawing of an iron mask, collar, leg shackles, and spurs (b) demonstrates the various cruel and painful instruments used to restrain slaves. Slave parents had to show their children the best way to survive under slavery. This meant teaching them to be discreet, submissive, and guarded around whites. Parents also taught their children through the stories they told. Popular stories among slaves included tales of tricksters, sly slaves, or animals like Brer Rabbit, who outwitted their antagonists ([link]). Such stories provided comfort in humor and conveyed the slaves’ sense of the wrongs of slavery. Slaves’ work songs commented on the harshness of their life and often had double meanings—a literal meaning that whites would not find offensive and a deeper meaning for slaves. 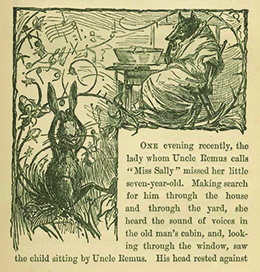 Brer Rabbit, depicted here in an illustration from Uncle Remus, His Songs and His Sayings: The Folk-Lore of the Old Plantation (1881) by Joel Chandler Harris, was a trickster who outwitted his opponents. The styles of worship in the Methodist and Baptist churches, which emphasized emotional responses to scripture, attracted slaves to those traditions and inspired some to become preachers. Spiritual songs that referenced the Exodus (the biblical account of the Hebrews’ escape from slavery in Egypt), such as “Roll, Jordan, Roll,” allowed slaves to freely express messages of hope, struggle, and overcoming adversity ([link]). 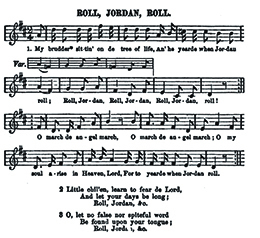 This version of “Roll, Jordan, Roll” was included in Slave Songs of the United States, the first published collection of African American music, which appeared in 1867. Most free blacks in the South lived in cities, and a majority of free blacks were lighter-skinned women, a reflection of the interracial unions that formed between white men and black women. Everywhere in the United States blackness had come to be associated with slavery, the station at the bottom of the social ladder. Both whites and those with African ancestry tended to delineate varying degrees of lightness in skin color in a social hierarchy. In the slaveholding South, different names described one’s distance from blackness or whiteness: mulattos (those with one black and one white parent), quadroons (those with one black grandparent), and octoroons (those with one black great-grandparent) ([link]). Lighter-skinned blacks often looked down on their darker counterparts, an indication of the ways in which both whites and blacks internalized the racism of the age. 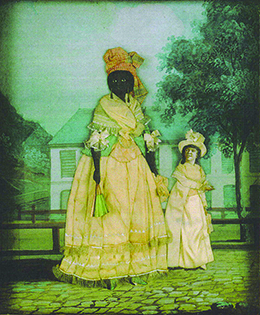 In this late eighteenth-century painting, a free woman of color stands with her quadroon daughter in New Orleans. Families with members that had widely varying ethnic characteristics were not uncommon at the time, especially in the larger cities. New Orleans had the largest slave market in the United States ([link]). Slaveholders brought their slaves there from the East (Virginia, Maryland, and the Carolinas) and the West (Tennessee and Kentucky) to be sold for work in the Mississippi Valley. The slave trade benefited whites in the Chesapeake and Carolinas, providing them with extra income: A healthy young male slave in the 1850s could be sold for 30,000 in 2014 dollars), and a planter who could sell ten such slaves collected a windfall. 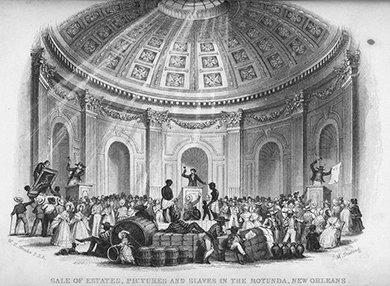 In Sale of Estates, Pictures and Slaves in the Rotunda, New Orleans (1853) by J. M. Starling, it is clear that slaves are considered property to be auctioned off, just like pictures or other items. In fact, by the 1850s, the demand for slaves reached an all-time high, and prices therefore doubled. A slave who would have sold for 800 in the 1850s. The high price of slaves in the 1850s and the inability of natural increase to satisfy demands led some southerners to demand the reopening of the international slave trade, a movement that caused a rift between the Upper South and the Lower South. Whites in the Upper South who sold slaves to their counterparts in the Lower South worried that reopening the trade would lower prices and therefore hurt their profits. African Americans in the Antebellum United States by OpenStaxCollege is licensed under a Creative Commons Attribution 4.0 International License, except where otherwise noted.